Lorries transporting oil palm fruits in Felda Bukit Mendi near Bera yesterday. 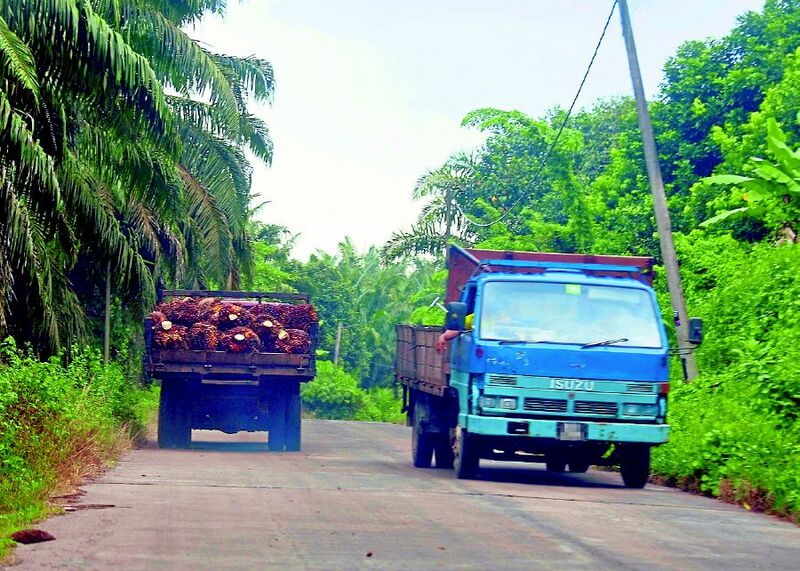 KUANTAN: The low prices of second-hand three-tonne lorries have prompted Felda settlers across the state to buy the vehicles to transport oil palm. State Criminal Investigation Department chief Senior Assistant Commissioner Othman Nanyan said there was an increase in the number of stolen lorries from around the country ending up in plantations. He said the police last month crippled a four-member syndicate and recovered 12 stolen vehicles, including a Mitsubishi Pajero four-wheel drive. “The settlers were attracted by the low prices offered for the lorries, which included Daihatsu Delta, Isuzu, Hicom Perkasa and Mitsubishi models. Since there was demand from certain settlements, it prompted the syndicate to sell the vehicles there. “The syndicate busted last month has been selling vehicles for between RM20,000 and RM30,000, but the members are new in the illicit business. He said people dealing with stolen property could be detained under the Penal Code. He advised settlers not to buy or use stolen vehicles, and reminded them to lodge a police report if they noticed individuals trying to sell such vehicles. Bera police chief Deputy Superintendent Mansor Samsudin, whose officers crippled a major syndicate in March with the seizure of 24 lorries at Felda Kemasul, Bentong, and Felda Bukit Mendi, Bera, said the syndicate members had altered the chassis numbers of the vehicles. “The syndicate used a grinder to alter the engine number before sending the lorries to the settlements. We got a break when one of the middlemen was nabbed. He led police to where the stolen lorries were sold. “Felda settlers should never be tempted and if they come across such deals. They should contact the police or Road Transport Department (RTD) to verify the details of the vehicles,” he said, adding that buyers often assumed they were getting a bargain when, in fact, they were landing themselves in trouble. A police source said vehicle theft syndicates were smart as they would hire middlemen or someone known to thesettlers to negotiate deals. “Besides tampering with the chassis numbers, syndicates will also spray false private company names on the vehicle door to convince buyers that the lorries belonged to certain companies that failed to service their bank loans. The fake registration numbers usually belong to motorcycles. He said in most cases, the middlemen were familiar or had knowledge of the settlements as it was unlikely for someone to suddenly turn up with a stolen vehicle and trying to sell it. “For example, when individual A buys the lorry, he will tell others and then, when individual B is interested, A will share the contact details. “Such dealings have been around for quite some time and still exist in certain estates,” he said, adding that modern gadgets (smartphones) and social media could play an important role in preventing such fraud.